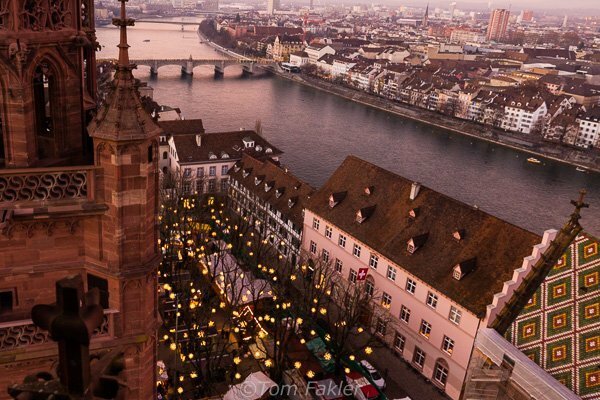 Christmas in Basel attracts visitors from all over the world–more than 1/2 million of them. Since 2011, the Christmas market at Münsterplatz, Basel’s best known square, has been a centerpiece of the city’s Christmas festivities. 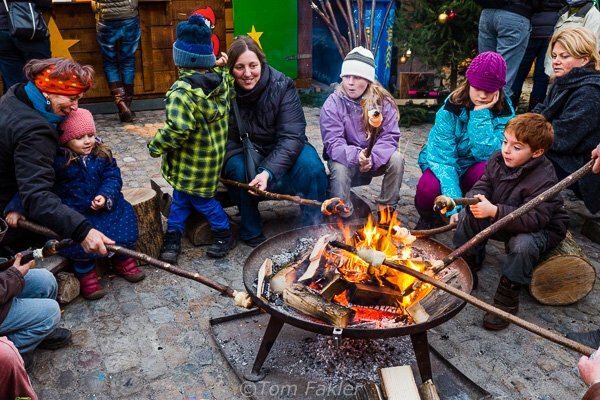 This year’s Basler Weihnacht kicked off in late November at the big square fronting Basel’s former cathedral, and until shortly before Christmas, offers shopping, food and drink, and activities for children. At Münsterplatz, vendors offer goods from around the world, nearby Germany and France. 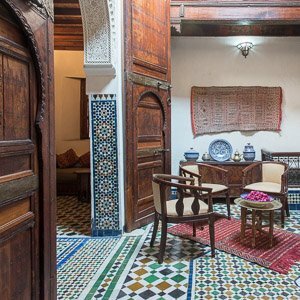 There are locally crafted pottery and glass object as well. The Tinguely Museum has a stall here, and across the way, a Märchenwald, or fairytale forest, is popular with families. 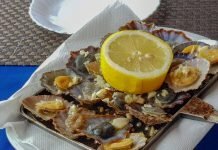 As at Barfüsserplatz, there are food stalls, as well as gift stands. In the evenings, everything is bathed in the light of “snow globes”. A giant tree in front of Basel’s former cathedral is decorated with ornaments in silver and gold from the Johann Wanner Christmas House. 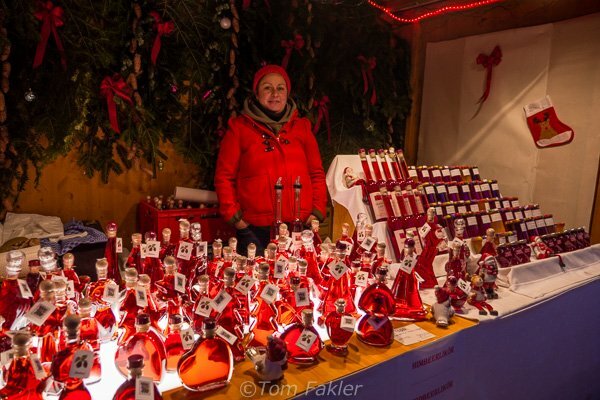 Christmas stalls at Münsterplatz are set out like a small town under chestnut trees decorated with “snow globes”. 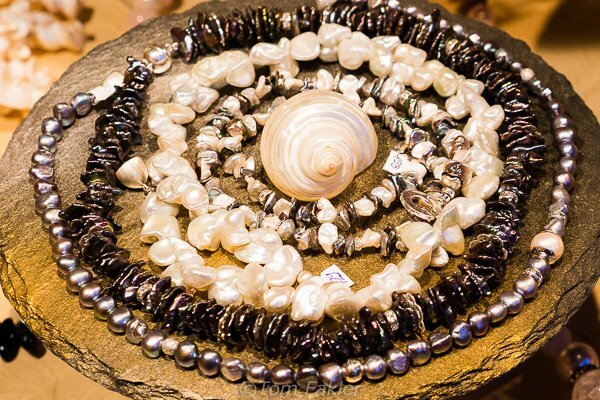 In a Christmas stall on Basel’s Münsterplatz, handmade necklaces and bracelets are artfully displayed on a slab of slate. 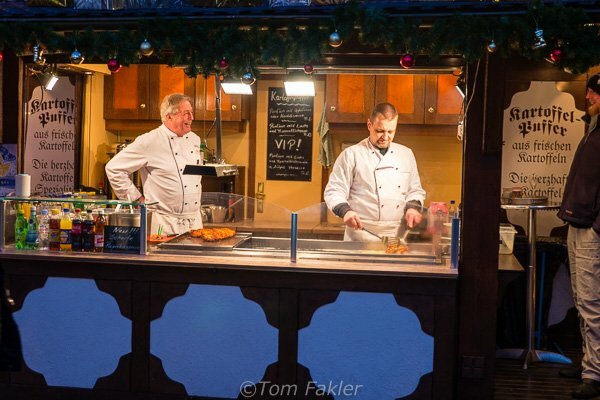 One of the friendly vendors at the Münsterplatz Christmas market. The brightly colored bottles contain liquors and syrups made of raspberry and strawberry. 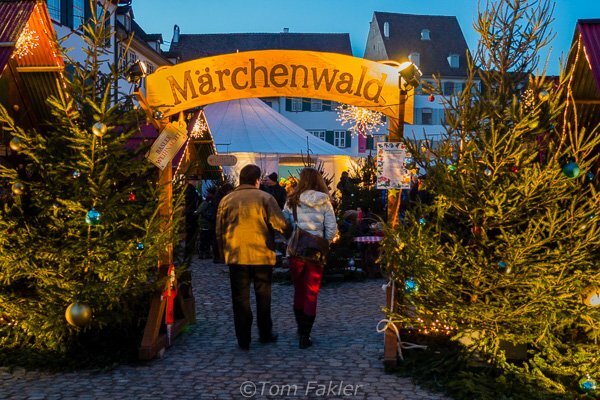 The Märchenwald offers a range of activities for families, as well as Christmas trees for sale. 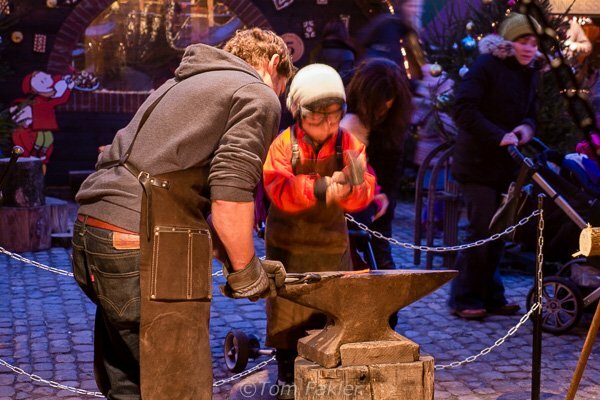 Kids get to don goggles and–under the watchful eye of a blacksmith— try their hand at forging bits of hot iron. These folks are making “campfire pretzels”, pretzel bread dough wrapped around wooden sticks. Dapper chefs prepare fresh potato puffs, served with a choice of savory salmon and horseradish sauce, or sweet apple compote. 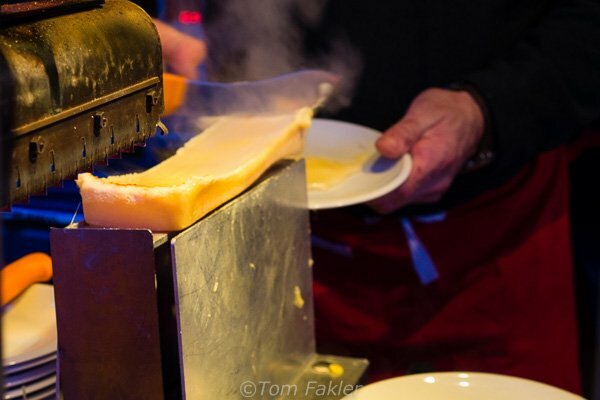 It wouldn’t be Switzerland without raclette! The heady aroma of melting raclette cheese draws fans for a hearty snack and a glass of spritzy Swiss white wine. 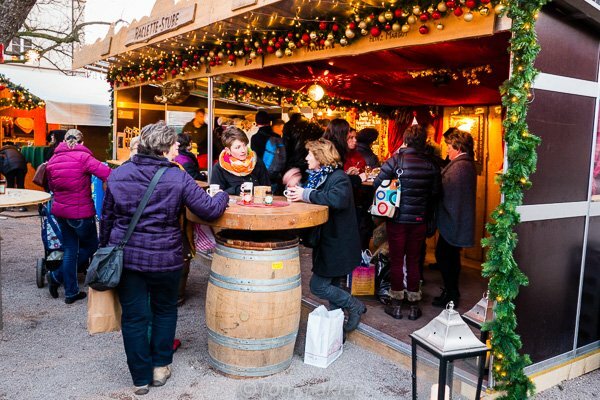 In front of the raclette stall, stand-up tables made of wine barrels offer a place for friends to share a plate of cheese, or just a mug of mulled wine. 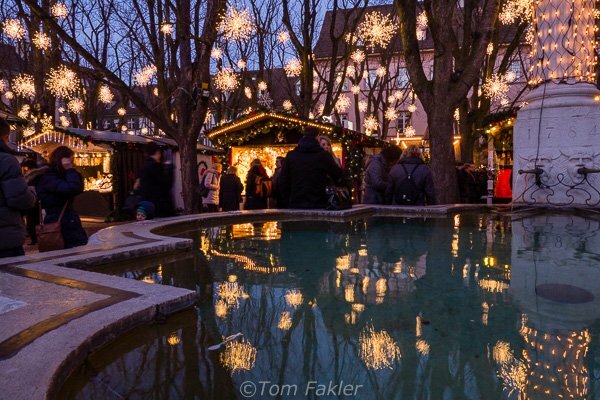 The Münsterplatz fountain reflects the lights of the Christmas market beside Basel’s former cathedral. 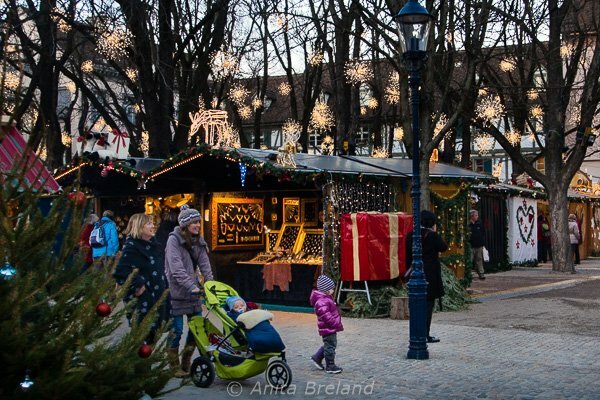 The Christmas market runs until 23 December. 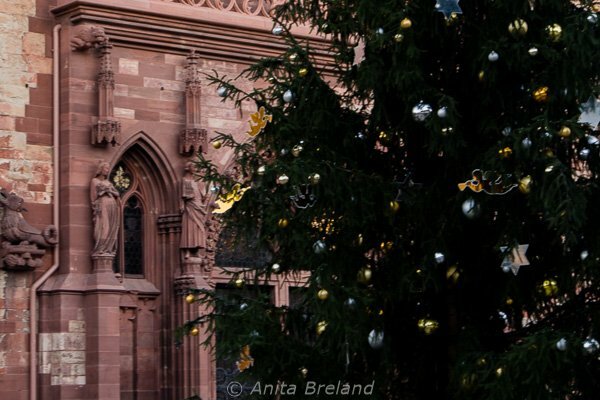 The Münster holds weekday afternoon services during Advent, and will have a Christmas Eve program featuring the Knabenkantorei Basel (Basel Boys Choir). Come Sylvester, as New Year’s Eve is called here, Münsterplatz will be the place for many locals to ring in the new year with a glass of champagne. A brief concert features the trumpets and trombones of the Stadtposaunenchor playing on the upper balcony of the church, and is followed by fireworks over the Rhine. 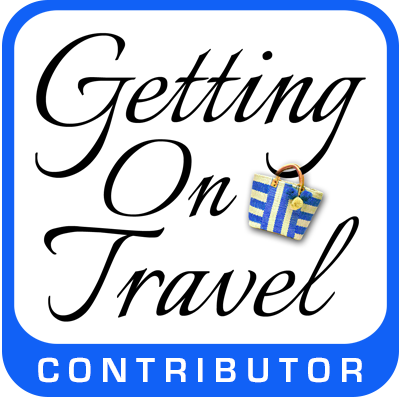 Here’s a preview, from Sylvester 2011!